Pretty much how the Deadpool movie was like in India.With most of the gratuitous violence intact,but with a LOT of the dialogue and profanity censored.This rendered a lot of the movie into an incomprehensible mess.Which is a pity,from what I saw,the movie was fun. The censors need to grow up.So I can watch immature stuff, unhindered. could i get this full version 6614×4677 to download please? Well you just "Nailed it!" literally....and I too hate the censor-board in here...our country is great but these immoral s make it less at this rate! I am also worried because of censorship in Deadpool's. Because I will watch a movie over the Internet. I'm waiting eagerly for the digital video release! I found the overuse of f words et cetera kind of childish tbh, but a cool movie nevertheless. Great image btw. YIKES! I'm sorry India had to be a bunch of pussies and censor a COMIC BOOK FILM. Insanity. I like their priorities, bloodshed is okay to see, but he said a naughty word! *gasp* Stop the presses we MUST censor this! 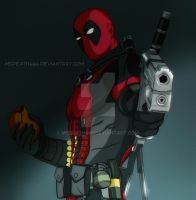 Seriously, Deadpool is the merc with the mouth, his banter/dialog is the heart of the character. Funny thing was, Colossus and Negasonic acted as if they seemed to think the movie was PG-13. Can't you watch the movie uncensored on the internet? When it releases eventually a few months down the line,sure! Great work! The pose is excellent! That bit of dialogue made it through. Not really the merc with a mouth if they censor everything :/ Gorgeous illustration though! Why censor an R rated movie? I'm sorry they butchered it like that. I saw it here (USA) last night. My biggest problem was there were so many kids in the theater and it wasn't the theaters fault for being careless, parents had to cover their kids eyes for half the movie. Exactly.They should trust adults with what they want to see. Wow,why would parents bring kids to this?They must have assumed its just another marvel movie. Wow really sorry to hear that! So the violence was left but the words were censored?!!?!?!? That make no sense at all! Anyway great work, hope that you are able to see with all of the dialogue intact! I'll have to wait for the blu-ray release to see the movie properly.Good thing they'll be releasing a director's cut! Hopefully it will not get banned over your way, if not you can always order it on line! Take it easy!